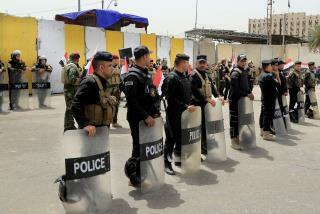 (Newser) – Hundreds of protesters climbed over the blast walls surrounding Baghdad's highly-fortified Green Zone for the first time on Saturday and stormed into parliament, carrying Iraqi flags and chanting against the government. The breach marked a major escalation in the country's political crisis following months of anti-government protests, sit-ins, and demonstrations by supporters of influential Shiite cleric Muqtada al-Sadr, the AP reports. The Green Zone is home to most ministries and foreign embassies and has long been the focus of al-Sadr's criticism of the government. Earlier Saturday, al-Sadr accused Iraqi politicians of blocking political reforms aimed at combating corruption and waste. NICE!!!!! Pass the popcorn and let the Sunni/Shia war heat up even more. Much luck to each side as you kill each other off. We have the perfect opportunity to clean out the Middle East once and for all. Just stir the pot and stir the pot and let these peace loving morons kill each other off over there to the last goat humper. We should have killed al-Sadr back when we had a chance. He is responsible for many American deaths and has been allowed (yes, allowed) to get away with it. Savages. Let them blow each other up.